Mr. Giacchino has a great deal to live up to when it comes to the music of Star Trek. He not only has to pay homage to the beautiful scoring of original series theme tune composer Alexander Courage, and by default include 'that' tune in the score, but he's got a whole bunch of rather brilliant musical giants peering over his shoulder; Jerry Goldsmith (the score for Star Trek: The Motion Picture is quite frankly a work of god-like genius), Dennis McCarthy (a very under-rated score for Star Trek: Generations), James Horner (Wrath Of Khan. Say No More) and Cliff Eidelman (the end title score of Star Trek VI with the accompanying sign off from the original cast is enough to make grown men weep). I know if I'm enjoying an original score. You've seen the film and it's helping you replay lots of great bits of the film in your head before the DVD comes out or you pay for another cinema ticket, or the music doesn't necessarily need the film to inspire you and is so strong and powerful that it totally stands in isolation as great film music. With Star Trek, Giacchino most definitely falls into the latter camp. I can't vouch for the former because I'm sat here listening to the music from a film I have yet to actually see! But I'm no stranger to that scenario. I ploughed through most of John Williams' music for the original Star Wars trilogy well before I turned up at the pictures to see the films. So what does Giacchino's music say to us in its brief 45 minute outing on this album? The impression I came away with was that we are about to see a punchy, fast moving action flick, full of jeopardy and darker, vengeful moments, and it's pretty epic in scope. Big, big brass sections, driving strings, rattling percussion and some outstanding choral work too. It's a very colourful score, running the gamut of bold orchestration, both thundering along to action set pieces and full of beautiful subtleties (and if you like his Lost scores you'll really like these) when needed for the quieter character driven moments. He's also got his own Star Trek theme threading through much of the music. It's terribly heroic, a nicely controlled bombast but quite easily fits in with the stablemates of previous films. There's a James Horner flavour in there with a series of rising motifs, certainly rather well showcased on Back From Black, perhaps indicative of Kirk's journey from cadet (in black uniform) to 'Captain' (in yellow uniform) but that first makes its mark in the opening Star Trek. Slow, full, round brass, quite mournful, dotted with metallic sounding percussion and that drives, with subtle strings, towards one of those typical Giacchino crescendos. Nailin' The Kelvin does what it says on the tin and is big, militaristic stuff scoring the battle between the U.S.S. Kelvin and Nero's ship, the Narada. 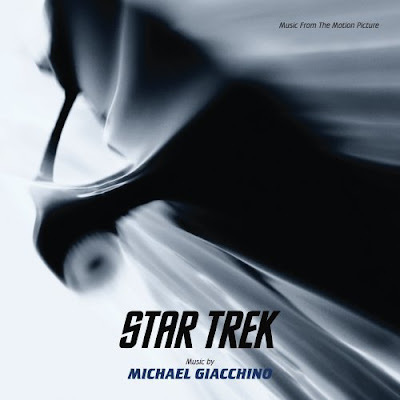 Pounding beats, flaring brass and swirling strings that again pick out Giacchino's own Trek theme. Labor Of Love is soft, pirouetting high strings, with harp and warm brassy passages very much in the style of Lost. A very romantic piece of scoring which I suspect might be the theme for the Enterprise (*I was proved wrong - it plays over the shuttle escape from the Kelvin and the death of George Kirk and it works stunningly). It's so lovely and conveys a sense of majestic flight through space. More Lost like, repetitive high strings and woodwind, lush and warm, and again carrying his Trek theme, that's then broken by clapping percussion make up Hella Bar Talk which to me might suggest the conversation between Pike and Kirk. Enterprising Young Men is all guns blazing Elmer Bernstein stuff, very rousing with some booming drums joining skittering percussion, whalloping big brass and strings. It bounces along and, again, is sweeping music, truly fit for heroes. It rises into an escalating brass serenade and ends wth a staccato round of drums. Fabulous. The militaristic feel is well and truly the groove of Nero Sighted, echoing a great deal of Horner's Wrath Of Khan score and then about half way through it goes all Goldsmith on us, with a screech of high strings and some nice atonal passages, slowing to a heartbeat and then building again, brass sections powering up as I suspect the Narada sweeps across the screen. 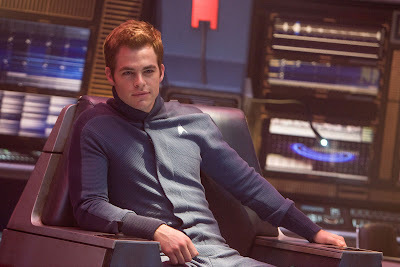 Nice To Meld You is a bit of giveaway I think and is possibly scoring a particular meeting between old and new Trek that the Nimoy flavoured trailer has been hinting at. Swirling and dancing strings and brass that suggest an inner journey into the Vulcan mind and back into the past. Lovely flourish at the end which sounds quite mournful. More gung-ho drum and brass overlapping and string accentuation that picks up a pace in Run And Shoot Offense, momentarily broken by some very Bear McCreary sounding exotica picking up into a rousing theme that develops into a full throttle chase motif. That mournful passage may suggest Nero's motivation in the film, which is allegedly vengeance for past action, and it's carried through into the next track Does It Still McFly? The longer cue Nero Death Experience is a series of rising military motifs that are then joined by a phenomenal bit of choral work, swirling harps, attacking brass and strings in a very operatic and threatening, nightmarish piece of music. One of the best tracks on the album and I can't wait to see where this fits into the film. The end of the track is just wonderful, with his Trek theme insistent on the brass and accompanied by screeching strings then offering a pounding piece of choral, brass and string crescendos that end with the Courage four note opening to the original theme. I've no idea if the track listing here is the order in which the music appears in the film but Nero Fiddles, Narada Burns does indicate that the villain's copped it and his ship is in a right state. Again, the brass is wonderful and there some weird tonalities in the middle of the choir, drums and strings. Really triumphal stuff. That New Car Smell is quite lovely. Eastern instrumentation, perhaps the erhu, the "Chinese violin", and again very BSG, has been used here for a fairly mournful, elegiac piece with strings and piano, incorporating more Lost like flavours but with a smashing, romantic and emotional nod to Goldsmith's Motion Picture soundtrack (* and is actually the theme for Spock and the Vulcans. Works beautifully). Finishing on full throttle with a gorgeous bit of brass, chimes, flute and strings it's another superb highlight for me and is a very moving section of the score. The undoubted highlight is To Boldy Go and the way it segues into the End Titles. This is Giacchino grabbing the Courage theme and just turning it into the most sweeping, operatic version you'll ever hear, punctuated by his own Trek themes and many of the motifs from the soundtrack. It's bold, heroic, sassy and will leave you with a ruddy great smile on your face. Nine minutes that are a perfect summation of what has come before with Alexander Courage's theme at the helm. No arguments about Michael Giacchino's predecessors, but it's not fair to leave out the late Leonard Rosenman's effort for Star Trek IV: The Voyage Home. Even if his main theme does riff from his own The Lord of the Rings. Not to put too fine a point on it but I think Rosenman's efforts were the worst of the lot. Hence his absence from the roll call of far, far better composers. Sorry, but when it comes to quality I didn't rate his music particularly highly. I love Rosenman's Star Trek IV main theme. Especially at the end credits as we saw scenes from earlier points in the movie.. It's OK but as Cindylover1969 quite rightly says above it is heavily derivative of his score for The Lord Of The Rings. It is by no means a bad score it just isn't my personal favourite and, yes, I was being a tad harsh in my earlier response. Must have got out of bed the wrong side this morning. I'm such a grump at 8.00am without a good cup of coffee! I must say I was eagerly awaiting, yet manifestly disappointed in this soundtrack. Perhaps I am too spoiled by the legendary Goldsmith effort (wherein his "The Enterprise" may be one of the most astonishingly beautiful pieces of music I've ever heard), but I expected a far stronger and more memorable base Trek theme to resonate from this soundtrack. what surprised me was, even in varying moods and tempos, a frustrating anonymity in many of the pieces. Clearly, "To Boldly Go" is the highlight of the soundtrack. I was hoping for an equally bold effort from a fresh composer to give this "new generation" of Star Trek an equally memorable theme. Alas, I come away disappointed. David, I'm sad at your disappointment. I say keep listening to it. It's a real grower of an album and I have to say many of the themes have been going around in my head ever since I heard it so I'd dispute its anonymity. I purchased the soundtrack, excited to hear the one piece I didn't during the film, or maybe I was to distracted by the movie to notice: the music behind the third trailer. As I discovered after some serious digging, the trailer music wasn't composed by Giacchino, nor is it part of the film or soundtrack. A HUGE oversight as many people I met changed their mind about seeing the film because of that music. As it turns out, it was composed and recorded specifically for the trailer by a company that specializes in music for movie advertising called Two Steps From Hell. You might have heard their work on the second ST trailer, The Mummy, Babel, etc. their pieces, are FAR better IMHO than the entire score by Giacchino. Yes, the Two Steps From Hell trailer music was good. However, it is very common practice for studios to source music specific to trailers that isn't going to be in the finished film and is not always by the same composer. I think the big choral pieces on the soundtrack are just as good as the Two Steps From Hell stuff IMHO. I saw the film again yesterday and I really do believe that Giacchino's score is perfect for the film. It works beautifully. As a stand alone soundtrack album it may not be to your taste and that's rightly open to debate. It isn't as good as the Goldsmith and Horner Trek scores but it's still damn good. The trailer music did its job, as it was designed to, and it got people in to see the film. Standard Hollywood procedure. The fact that the music wasn't in the film shouldn't really matter because the film and the score itself more than compensates IMHO. To me, it's a bit too similar to the Zimmer/Howard stuff for The Dark Knight. Good though. I downloaded the soundtrack from iTunes, and I really enjoyed it. I know a lot of Trekkers from the 60's like me don't like the reboot or the soundtrack, but I do and it's certainly better than letting the franchise die. It would have been great to have one more Jerry Goldsmith score, but he's gone. Besides, there's no guarantee Abrams would have used his services if he were still with us. End of rant. I have a question for anyone who bought the CD. Is there enough information in the liner notes to justify buying the CD since I already have the music? Thanks for your help. Peace and long life.